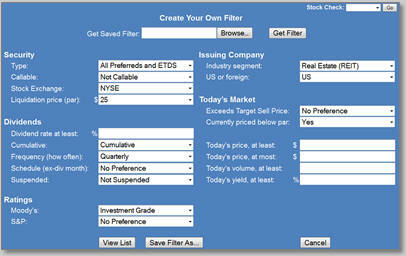 Even in this high-priced market, there are still investment grade choices priced below their $25 par value. Out of the 990 preferred stocks and exchange-traded debt securities that were trading on U.S. stock exchanges at the end of October 2012, nineteen specific issues with Moody's investment grade ratings were trading below their $25 par value (October 26, 2012 prices). That's up by one security from the previous month, a hopeful sign that the record-high prices that we have seen for U.S. preferred stocks over the last few months may be returning to something closer to normal. 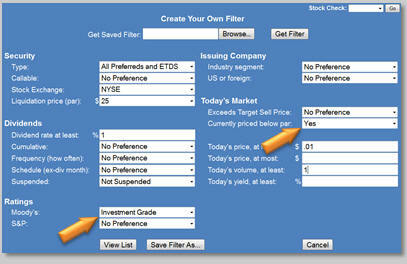 Figure 2 shows the results when this search is applied to our Preferred Stock ListTM database (please note that to protect the values of subscriptions to the CDx3 Notification Service, trading symbols are obscured here). Already a subscriber? 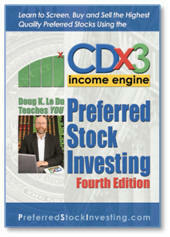 See page 6 of the November 2012 issue of the subscriber's newsletter, CDx3 Research Notes, that you received on November 3 for symbols. The five securities shown in green font are ETDs (bonds that trade on the stock exchange rather than the bond market and are very similar to preferred socks) while the remaining fourteen securities listed are preferred stocks. All have a current market price (seen in the Last Price column) that is below their $25 par value (as shown in the Liquid Price column) and enjoy an investment grade rating from Moody's (the Moody's column). Purchasing shares below $25 is an important consideration for many preferred stock investors. In the event that your shares are redeemed (bought back from you) by the issuing company, shareholders will receive the security's par value in cash in exchange for their shares. 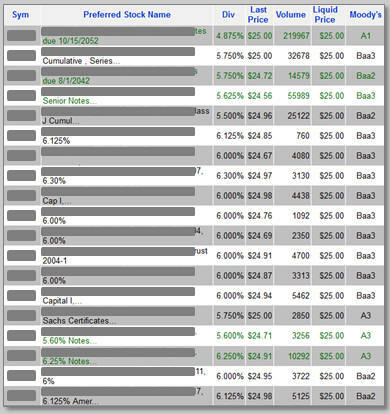 By purchasing shares below their par value ($25 in most cases and in all of the nineteen cases shown here), preferred stock investors are able to add a layer of principal protection to their investment while also positioning themselves for a downstream capital gain in the event of a future call. Already a subscriber? The trading symbols for this example are provided on page 6 of the November 2012 issue of the subscriber's newsletter, CDx3 Research Notes. (Already a subscriber? For actual symbols see page 6 of the November 2012 issue of the subscriber's newsletter, CDx3 Research Notes). Preferred stock investors have endured a massive number of redemptions of REIT-issued preferreds and exchange-traded debt securities (ETDs) throughout 2012, but the abundance of calls is likely to now subside through 2015. Almost all REIT-issued preferred stocks and ETDs have a five year redemption period. Five years after their introduction to the marketplace, the issuing company regains the right to redeem the security (buy your shares back from you). That means that for the rest of 2012, 2013 and 2014 the REIT-issued preferred stocks and ETDs issued during late-2007 through 2009 are about to become redeemable. In other words, the five-year call window is now opening for REIT-issued preferred stocks and ETDs that were issued during the Global Credit Crisis. But it is the timing of the crisis years, overlaid with the five year redemption period of most REIT-issued preferred stocks, that is about to bring relief from the constant redemptions we have seen this year. Because of the economic dynamics during the crisis years, REITs all but stopped issuing preferred stocks. Between March 2007 and December 2009, cash-starved banks started issuing preferred stocks (primarily trust preferred stocks) offering higher and higher dividend rates, all the way up to 9.6% (BBT-B from BB&T Corporation, since redeemed), in order to attract wary investors. At the same time, vacancies of existing commercial properties soared and 60% of the licensed architects in the United States were estimated by the American Institute of Architects to be idled. The need for expansion capital by REITs went to nearly zero. Historically, REITs issue about two new preferred stocks and ETDs per month. 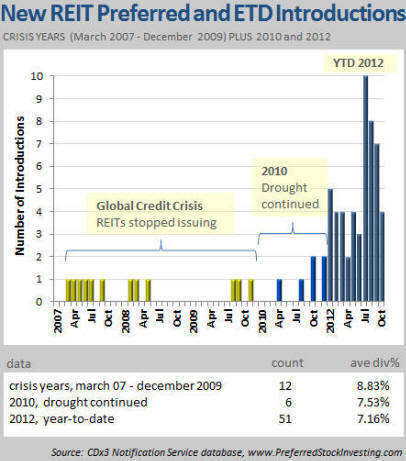 As Figure 3 illustrates, during the 34 month crisis period (March 2007 through 2009) there were a total of only twelve new preferred stocks and ETDs introduced by REITs. This chart also shows how that compares to the bumper crop of 51 new issues that today's lower rates triggered throughout the first ten months of 2012. Since so few REIT preferreds were issued during the crisis years, five years later we have now entered the corresponding redemption gap for these securities. In fact, since only six REIT preferreds were introduced during 2010 it is likely that the redemption gap for REIT-issued preferred stocks and ETDs will continue through 2015. It can also be argued that most of the REIT preferreds issued prior to 2007 that are going to be called already have been since preferred stock dividend rates, having hit new lows during the summer, appear to have leveled off. Currently, rates offered by new issues are relatively stable. 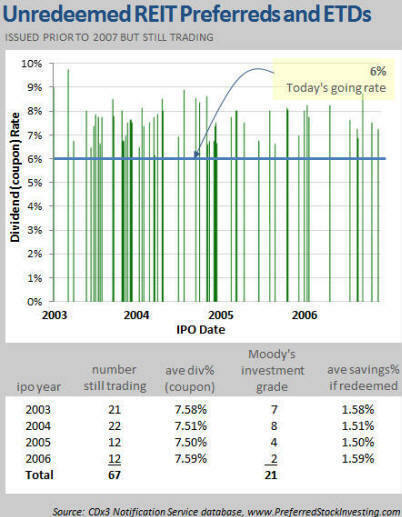 Of the 163 dividend-paying, REIT-issued preferreds and ETDs currently trading, Figure 3 shows the 67 that were issued prior to 2007 and have higher dividend rates (coupon) than today's going rate of about 6% for such securities. And note that about one-third of these issues carry Moody's investment grade ratings, too. All of these 67 securities have been redeemable for one to five years now. Given their average 7.5% dividend rates, there is substantial cost savings to be had (1.5%+) by redeeming these issues in favor of new, lower payers. And yet, all have continued trading. The implication here is that dividend cost savings is apparently not the primary motivation for the issuing companies of these long-redeemable securities. Given the alignment of the Global Credit Crisis and the five-year redemption period of REIT-issued preferred stocks, very few of which were issued during the crisis years, the breakneck rate of REIT preferred stock redemptions that preferred stock investors have endured this year should now subside. While there are certain to be exceptions, if you hold redeemable REIT-issued preferred stocks and/or exchange-traded debt securities in your portfolio, there is every indication that you are likely to be enjoying the great 7.5% dividend income that they provide for the next several years.